The great thing about complex data is that one can basically come up with any number of headlines describing it – all of which can be literally true – but that give very different impressions. Thus we are sure that you will soon read that 2008 was warmer than any year in the 20th Century (with the exception of 1998), that is was the coolest year this century (starting from 2001), and that 7 or 8 of the 9 warmest years have occurred since 2000. There will undoubtedly also be a number of claims made that aren’t true; 2008 is not the coolest year this decade (that was 2000), global warming hasn’t ‘stopped’, CO2 continues to be a greenhouse gas, and such variability is indeed predicted by climate models. Today’s post is therefore dedicated to cutting through the hype and looking at the bigger picture. As is usual, today marks the release of the ‘meteorological year’ averages for the surface temperature records (GISTEMP, HadCRU, NCDC). This time period runs from December last year through to the end of November this year and is so-called because of the fact that it is easier to dice into seasons than the calendar year. That is, the met year consists of the average of the DJF (winter), MAM (spring), JJA (summer) and SON (autumn) periods (using the standard shorthand for the month names). This makes a little more sense than including the JF from one winter and the D from another as you do in the calendar year calculation. But since the correlation between the D-N and J-D averages is very high (r=0.997), it makes little practical difference. Annual numbers are a little more useful than monthly anomalies for determining long term trends, but are still quite noisy. The bottom line: In the GISTEMP, HadCRU and NCDC analyses D-N 2008 were at 0.43, 0.42 and 0.47ºC above the 1951-1980 baseline (respectively). In GISTEMP both October and November came in quite warm (0.58ºC), the former edging up slightly on last month’s estimate as more data came in. This puts 2008 at #9 (or #8) in the yearly rankings, but given the uncertainty in the estimates, the real ranking could be anywhere between #6 or #15. More robustly, the most recent 5-year averages are all significantly higher than any in the last century. The last decade is by far the warmest decade globally in the record. These big picture conclusions are the same if you look at any of the data sets, though the actual numbers are slightly different (relating principally to the data extrapolation – particularly in the Arctic). So what to make of the latest year’s data? First off, we expect that there will be oscillations in the global mean temperature. No climate model has ever shown a year-on-year increase in temperatures because of the currently expected amount of global warming. A big factor in those oscillations is ENSO – whether there is a a warm El Niño event, or a cool La Niña event makes an appreciable difference in the global mean anomalies – about 0.1 to 0.2ºC for significant events. There was a significant La Niña at the beginning of this year (and that is fully included in the D-N annual mean), and that undoubtedly played a role in this year’s relative coolness. It’s worth pointing out that 2000 also had a similarly sized La Niña but was notably cooler than this last year. While ENSO is one factor in the annual variability, it is not the only one. There are both other sources of internal variability and external forcings. The other internal variations can be a little difficult to characterise (it isn’t as simple as just a super-position of all the climate acronyms you ever heard of NAO+SAM+PDO+AMO+MJO etc. ), but the external (natural) forcings are a little easier. The two main ones are volcanic variability and solar forcing. There have been no climatically significant volcanoes since 1991, and so that is not a factor. However, we are at a solar minimum. The impacts of the solar cycle on the surface temperature record are somewhat disputed, but it might be as large as 0.1ºC from solar min to solar max, with a lag of a year or two. Thus for 2008, one might expect a deviation below trend (the difference between mean solar and solar min, and expecting the impact to not yet be fully felt) of up to 0.05ºC. Not a very big signal, and not one that would shift the rankings significantly. There were a number of rather overheated claims earlier this year that ‘all the global warming had been erased’ by the La Niña-related anomaly. This was always ridiculous, and now that most of that anomaly has passed, we aren’t holding our breath waiting for the ‘global warming is now back’ headlines from the same sources. Taking a longer perspective, the 30 year mean trends aren’t greatly affected by a single year (GISTEMP: 1978-2007 0.17+/-0.04ºC/dec; 1979-2008 0.16+/-0.04 – OLS trends, annual data, 95% CI, no correction for auto-correlation; identical for HadCRU); they are still solidly upwards. The match of the Hansen et al 1988 scenario B projections are similarly little affected (GISTEMP 1984-2008 0.19+/-0.05 (LO-index) 0.22+/-0.07 (Met-station index); HansenB 1984-2008 0.25+/-0.05 ºC/dec) – the projections run slightly warmer as one would expect given the slightly greater (~10%) forcing in the projection then occurred in reality. This year’s data then don’t really change our expectations much. You can get slightly different pictures if you pick the start year differently, and so this isn’t something profound. Picking any single year as a starting point is somewhat subjective and causes the visual aspect to vary – looking at the trends is more robust. However, this figure does show that in models, as in data, some years will be above trend, and some will be below trend. Anyone who expresses shock at this is either naive or … well, you know. As for the next few years, our expectations are not much changed. This coming winter is predicted to be ENSO neutral, so on that basis one would expect a warmer year next year than this year (though probably not quite record breaking). Barring any large volcanic eruption, I don’t see any reason for the decadal trends to depart much from the anticipated ~0.2ºC/decade. Update: Just FYI, the same figure as above baselined to 1990, and 1979. Defining climate merely as average surface temperature is far too simplistic. What would be interesting to look at, rather than mean annual temperatures is the variability of temperature and precipitation patterns throughout the year. A predicted consequence of anthropogenic warming is a more varied climate, more severe ups and downs. Are we seeing that? When Alaska is having record warmth and Florida is seeing record cold, these two tend to cancel each other out when looking at average temperature, but taken together are more indicative of what is actually happening. Are any of these agencies producing variability data sets? been determined that could have greater than the .1C impact you describe above? Further, in April 2008, scientists at NASA’s Jet Propulsion Laboratory announced that while the La Niña was weakening, the Pacific Decadal Oscillation – a larger-scale, slower-cycling ocean pattern-had shifted to its cool phase. Well, it remains to be seen how global climate will evolve in decades to come. Re #1 You, more that anyone – might define the standard assemblage of data sets that best describe global climate change. Or has anyone defined such a set? Didn’t the Al Gore movie tell us that weather would be more extreme due to global warming? When Todd Albert talks about varied climate, is he not referring to weather according to your terminology? Ah Gavin, you are spoling the long winters nigths with your high calibre science. What else are we all going to argue about if you scientsits profess to have been telling the truth for 30 years. Damm all of you for your rational scientific research, measurements and good scientific theories. MERRY CHRISTMAS – always been an awesome site for us lot. Todd, there is varied weather,and some climate variations, but not quite how you mean it. The averaging of the trend does indicate warming globally, and the earth is still warming now. What does happen in a giben month, year and sometimes decades is faster or slower warming for the given time period, but this does not reverse the warming trend or do anything to refute the dangers to health that GHG’s present with. You would have to have a 30 year period (or even more) where the magnitude of localized warming and cooling were shown to summate equally where no net warming occured whatsoever, but that is not what is shown. GHG continue to increase in amounts in the atmosphere and as such, over time more warming inevitably continues though there may be breaks for short periods, and some cooling, as already discussed at great length regarding aerosols. Gavin, good presentation as always, but this one in particular shows why global warming is still happening and why it will not just go away. Usually I see reference to more _local_ variability. Lots of results talking about agriculture and variability concerns. A variation of previous question. Even if increased AGW does not imply a more varied climate, would it be of any value to know what the models have say? Or is this old hat? Given that the “wiggles” have a random phase, can’t you estimate (from computer experiments with different initial conditions) some of the higher moments used by the statisticians? First with no forcing and then with a simulated increase of CO2? As for the suggestion of increased variability there is Figure 6.6 on page 129 of John Houghton’s book “Global Warming” (3rd.Edition) , which is a sketch graph of probability vs temperature (without numbers). One graph is shifted to the right (warmer) and broadened (more variability). Is the link just a speculation? Thus the coldest year of this century is, according to GISTEMP 2008, not 2000 as you assert. 2000 was part of the 20th Century! makes clear what I was vaguely groping toward in #9. I’ve been running some 30 year linear regression models based on GISS, Hadley, RSS, and UAH, inputting variables for volcanic (GISS), solar forcing (Satellite), ENSO (NOAA), and Net Anthropogenic forcing (GISS data). I found that with the 30 year time period, the solar trend is only a slight negative, ENSO is also sloped with a slight negative trend. I think volcanic forcing is on a warming trend, because volcanic activity is weighted towards the beginning of the 30 year period. So, I think my regression shows that Anthropogenci warming contributes to about 0.13C/decade out of the total 0.16C/decade (about 0.04C due to volcanic, and -0.01 due to solar and ENSO combined). Hadley had virtually the same results. RSS had just under 0.11C, and UAH had about 0.08C due to anthropogenic forcing. I also noticed that RSS and UAH had greater sensitivity to ENSO and volcanic forcings (I think it was about 50% larger sensitivity). Anyway, Gavin, I’m wondering if these findings are similar to the ones you have in understanding the last 30 years, regarding the relative forcing contributors to the 30 year temperature record. You mentioned 0.2C per decade, but I’m not sure if this was a forecast or a current trend. Thanks Gavin for your hard work and helping the public understand the issues. So now you have shown that the last 10 years flattish trend is not significantly different from models, because models have great variability. Fair enough! Since models have this variability, why is it that measured trends are calculated for only 30 years? By doing this, you always include the exceptional warming roughly between 1978 to 1998. Isn’t it more fair to include even more years, for example the last 100 years? If so, the trend would be some 0.7 deg C.
Why is the linear trend more appropriate since the models show anything but a linear trend? The chart, with 2000 as the base year at 0.0, looks like one the denialists might use, tho they’d probably pick 2002 to more clearly prove their point that GW is a hoax, and global cooling was happening. Might be good to also include a 100 year chart, or at least a 30 year chart. Then we’d see we were talking about some mole hill atop a mountain. Gavin, the near-term ENSO predictions are tilting ever so slightly towards another La Niña: http://www.bom.gov.au/climate/enso/. Weather variability? Yes, global warming increases absolute humidity so more extreme weather incidents are expected – as in more downpours and fewer drizzles. 2. 1984 does appear to be a GISS local minimum – why was this year chosen. 3. Temp trends which which begin before 1993/94 and after ~1981 are affected by the Pinatubo cooling (admittedly less so in the early 1980s than later). If the Pinatubo effect was removed, trends that begin in the post-1980s period would be remarkably similar to thosethat begin in the pre-1920 period. There’s clearly something else going on here. CO2 levels were completely different; Leif Svalgaard maintains there is very little solar effect – so, as Timo in #3 says, ocean circulation must be a big player. Is the ensemble mean the black line? Okay. I know this post is all about how the models show variation from year to year. Shouldn’t they also show variation from decade to decade? Or on even longer time scales? I haven’t seen yet anything definitive on the correct time frame to be looking at all of this. It is clear that one or two years is way too small a time frame. Is thirty years too short too? We have projections going to 2100 and, on this site, we have seen a rotating globe comparing two 5 year time frames. Well done here. Continued thanks. I’ll add my vote for & interest in hearing more about construction of an “index variable” that captures the variability of multiple components. c’mon, gavin, you’re not being fair. Why don’t you show AR4 model ensemble, al la Santer vs. actual temperatures. Volcanic activity is indicated by Stratospheric Aerosol forcing in the link below. There’s more than just Pinatubo to consider in the 30 year trend. There was sigificant strato-volcanic forcing data in 1982 and 1983. This partly explains why 1984 was a local minimum. (My model suggests a lag between volcanic forcing and temperature change of 1 or 2 years). This has more of an effect on the 30 year trend than Pinatubo because the effects of Pinatubo are around the middle of the time period. With a 1984 starting point, Pinatubo will have some effect, though maybe not substantial. I quantified the volcanic bias to account for about 0.04C/decade of the 0.16C/decade trend (global GISS land+ocean starting 1979). ENSO and solar have a slight negative slope. I think it is clear that ocean oscillation is a significant factor, and helps explain some of the anomalies along the way. It may even help explain (in part) some 30 year trends. The last 30 years, though, it seems to have had a slight negative effect. If you are looking at a 100 year trend, looking at the PDO data, I don’t think it contributes much to the slope, and if it does, I can’t tell which direction. A 60 year trend, maybe a little upward movement. It’s pretty much certain that the long term trend isn’t explained all that much by ocean oscillations. I think a large majority of the long-term trend (i.e. 100 years) is explained by anthropogenic warming. Whenever I try to model 30 year or 130 year trends, the fit is quite horrible without including anthropogenic forcings. With Anthropogenic forcings, it’s quite amazing how well the temperature series fits. Maybe it’s just correlation. I think when you couple sound physical science theory with supporting statistial correlation, you have a fairly credible theory. I disagree with climate projections in #3. I feel too much weight is being given to historical data trends. Abrupt climate change can not be ruled out. Alastair, the fact that you feel that failing to observe a convention established by a religious decree compromises the science is one of the most nonsensical contentions I’ve run across of late–and given the recent events in the news, that says a lot. Eli thinks you need go have a word with Roger. He is patting himself on the back again. For better or worse, that is a carrot free zone. Gavin asks Alistair (#11): “When did you celebrate the new millennium?” If he had any sense, twice :) . Something else I’ve been wondering about. Since Arctic ice is disappearing faster than expected, how does that appear affect the temperature trend? Aside from the positive feedback effect of lowering albedo, won’t taking latent heat of melting out of the equation — if the ice disappears early enough to make a difference — mean that temperatures go up faster for the same net energy change (even allowing that much of the missing ice used to be on land)? Thanks Gavin, for another great article. I’m keeping the URL only this time to save space. IF you convince the denialists of the 0.2 degrees centigrade per decade, the next thing they will say is “who cares?” I have found other places that say things like: “The rain moves a lot of miles for a small temperature change and agriculture fails soon;” and “6 degrees more and we go extinct when H2S is made in large amounts by ocean bacteria.” 0.2 degrees centigrade per decade requires 300 years to reach 6 degrees centigrade, so they aren’t interested. You noticed a non-linearity, but records don’t go back far enough to find a curve. Denialists will also claim that corn will grow well on thawed-out tundra, an idea I think most farmers would find silly. Thawed tundra just isn’t the same as Iowa top soil. I don’t know of a web site that publishes equally good articles as often on the horrific consequences for humans. There are several that sometimes post great articles on the consequences, but none that I know of that match RealClimate day after day. Do you know of one? 0.2 degrees centigrade per decade seems huge to me and you but small to denialists. I think it is a frame of reference thing, an education problem, an IQ problem and possibly an overdose of testosterone problem. so the cycle misses a doubling of sorts. the ice is substantially thinner due to clouds, and 2008 will have the same extent of 2007 likely soon. Its another December when it gets -40 C well south of the warmer Arctic as well. Just a nitpick. Common sense would dictate otherwise but I belive the 21st century started 1st of Jan 2001 – at least that’s how I recall it from a couple of years working out Y2K bugs, so assuming “this” decade is the first of the new century is not unreasonable compared to the rest of the spin. The problem is that a decade is literally “ten years in a row”, any starting point will do, the phrase “this past decade” makes sense, “this decade” is ambigious. Re #29, the Arctic losing it s ice faster than models predict might be down to natural variability as much as increased feedbacks due to global warming I have read. Gavin asks Alistair (#11): “When did you celebrate the new millennium?” If he had any sense, twice . Being Scottish I did celebrate New Year in 2001 as well as 2000! And I will celebrate it on 1st January again this year. But Gavin is starting his meteorological new year on the 1st December. What he is doing is using cherry picked dates to suit his arguments. The official start of the meteorological New Year is 1st December, and the official start of this century was not the day on which the Millennium was celebrated. It is the 1st Jan 2001. Why is this important? Because it makes it look as if Gavin can only answer the problem of why global warming seems to have stalled by fiddling the statistics. So he is giving heart to the sceptics, not defeating them. But it is also symptomatic of a much bigger problem. The upper troposphere is not warming in the way the models predict, but rather than listen to criticisms of the models he has been a contributing author to a series of papers which use dubious statistics to “prove” that the models are correct. In the latest of these Figure 6″ clearly shows little correlarion between any of the MSU and radiosonde data and the multi-model average (thick black line.) Only by adding a new set of MSU data RABCORE, which itself does not lie within the standard deviation in the upper troposphere, is the data made to look as if it averages out to meet the models. It is a case of two wrongs matches: radiosonde data and RAOBCORE calculations, being made to look like a the required match: multi-model average :-(. But it is only the radiosonde date that is correct. That is what is measured. If the models do not agree then they are wrong! I should point out that in the popular media that claims of global cooling have been very strident. Verbal attacks on mainstream climate science are perhaps louder than they have ever been. So what? I half expect someone in the Australian media to declare that we should burn more coal to ward off an impending Ice Age. If 2009 is another cool year everything could be turned around. Mitigation programs and research could be abandoned by governments. AGW as a popular idea could itself be in crisis with consecutive cool years. A good article, thanks ! But it is’nt sure that Niña passed. please, look at this link. Just to try to summarize what you say in your post, we can say: “according to the most recent observations (say last 10 years) one can declare that global warming is going on its way without any explainable change”. My question is : what should be the observations which should allow to say: “one can declare that global warming seems to have ceased”. Now, if after deep thought, it appears difficult to decide what should be different in the observations (to be allowed to declare the second) can we finally add to the first: “but nobody can say, for sure, that global warming has not actually ceased”. just jump to figure 4. 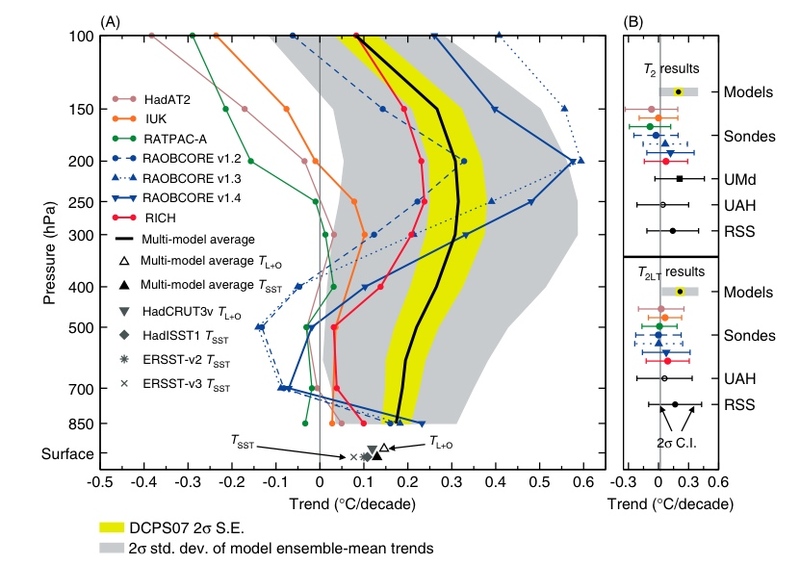 Even in scenario A2 the models produce still slightly negative or near zero decadal trends until 2040 or so. As often the observed and modelled variability is pointed out it doesn stop stupid remarks such as this citation stemming apparently from David Whitehouse. If the predicted cooling by la Nina had not occurred then 2008 would probably have been the same temperature (given the uncertainties) as every year since 2001 and that in itself would require explanation.I am broadly in favour of the global warming­CO2 hypothesis but I know it is just that, a hypothesis – and that needs testing against real observations in the physical world. If it isn’t, then it’s not science. These facts need to be emphasized very clearly in popular media. Ok fair enough, thanks. I did vaguely remember something about this but it came to me after I’d posted the message. But , as Todd in #23 points out, 1984 could have been affected by the El Chichon eruption which means that the early part of the 1984-2008 period was affected by 2 volcanic eruptions which must influence the trend. I’m not sure how you are including the PDO in your model, but Spencer (and others) has shown that PDO can be significant and may explain much of the 20th century warming. 1. The 100 year trend is only 0.07 deg/decade anyway so I wouldn’t expect the PDO long term trend to contribute much. It’s surely the periods where the trend is amplified which are of interest…..
2. We appear to have had 3 PDO shifts in the past 100 years, i.e. 2 cool->warm and one warm->cool which coincided exactly with the 2 strong warming periods and the mid-20th century cooling (or non-warming) period. Note the term PDO is used above as a generic term for ocean oscillation. I don’t think anyone is suggesting that there isn’t an AGW signal – just that it’s nowhere near as large as generally claimed. The timeline starts with a La Nina and ends with a La Nina but there are a number of El Ninos in the middle. There was La Nina in 1999 and 2000. El Ninos from 2002 into 2003, 2005 and 2006 into 2007. Then it ends with a La Nina starting mid-way in 2007 extending into 2008. If you pull the +/- 0.1C impact from these Ninos (they were not big enough to get to the 0.2C impact) – you have a pretty flat line throughout the period. I stole the title of your post for one of my own. I hope you don’t mind. Deniers, critics, skeptics… all rely on focusing on pieces of data. I have literally never seen one even attempt to deal with the totality of evidence. So, when 9 of the top ten warmest years have all been in the last 10 or 11 years, that’s a very large signal, particularly since it sits at the end of a very long upward trend. Could you please consider addressing this on Gavin? #42, John Fnn, I doubt that surface temps are doing a good job at measuring temp anomalies, because of stable weather from unusual planetary wave placements which sometimes give a rather large temperature anomaly noise signal. It is the weighted temperature of the the entire troposphere which matters. That calculation varies a whole lot less. Yet precluding DWT’s, AGW signal is still present with enormous implications for the Arctic first, as models capably suggested. Now, for any run of the mill contrarian to claim that the models are at best good for only one day forecasts is belligerence against the science they claim to understand. I’ve seen infamous Hall on CBC a while back, making a claim that current Arctic warming is nothing, has happened before, the man does not know the Arctic, has incredible ego, making himself the repository of climate science despite all other climatic red flags flashing in front of his eyes, he may be a retired U professor, with some support amongst a handful of yahoos who enjoy making a fuss. The very frozen sea scape has changed for thousands, if not millions of square kilometers, is like waking up one morning in a NYC without any cars. A TV starved for attention contrarian would gleefully say the buildings are still there, no change! The world wide temp anomaly is sometimes deceiving when interpreted by lobbyists, any normal climatologist would focus on the areas of the world where feedbacks are strongest to confirm without a doubt that AGW is present. And the temperature signal, if analyzed properly, is a whole lot steadier in favor of a slow but non stopping warming trend. The skeptics’ point is simple: The alarmists’ admit that the first half of the 20th century can be largely explained by natural variability – solar, etc. So plot a sin curve over the last 50 years. It sure looks like we’re simply at the peak of a natural curve, doesn’t it? There will be no consensus amongst the general population until the above argument is destroyed – not with scientific “mumbo-jumbo”, but actual disastrous data. The arctic sea ice will ~finish melting and then everyone will agree. Two to four years should be long enough. Then we’ll start brimstoning the atmosphere and merrily keep tossing CO2 as the problem will be “solved”. For my 30 year model, I tried adding PDO data, but it didn’t improve the fit at all. That’s not to say there isn’t a correlation. Rather, ENSO data provides a better fit to the temperature data points. When I took out ENSO, and threw in PDO, then there was improvement in fit, of about 1/3 to 1/2 the effectiveness of ENSO, over not having any ocean variables. NOAA had some data that proxies ENSO going back before 1950, so I used that in my longer term models. (After re-reading your comment, I see that you are using PDO more generically to include the effects of ENSO). Regarding the 100 year 0.07C/decade trend. The first 50 years had little or no net anthropogenic influence (there were forcings to be sure, but mostly offsetting). The first 50 years (my longer term model was based on GISS land station data) had something like a 0.15C upward trend due to increased solar activity, compared to a ~0.10C anthropogenic contribution. In the last 50 years, solar forcings were relatively flat, and anthropogenic contributions contributed about 0.6C. ENSO was up slightly, but by only about 0.03C in total. I don’t have the model in front of me, just a few graphs that resulted from my model where I’m eyeballing the increase.